Example of crowded video frame annotated using the new method. Credit: Růžička and Franchetti. 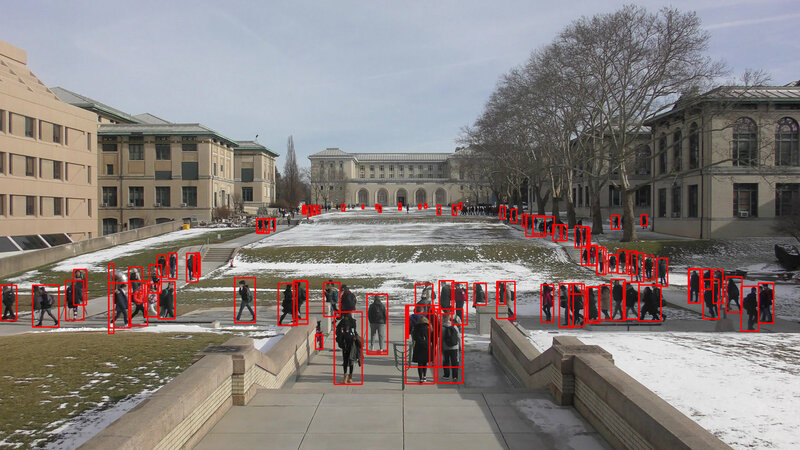 In recent years, machine learning has attained remarkable results in computer vision tasks, including object detection. However, most object recognition models typically perform best on images with a relatively low resolution. As the resolution of recording devices is rapidly improving, there is a rising need for tools that can process high-resolution data. "We were interested in finding and overcoming the limitations of current approaches," Vít Růžička, one of the researchers who carried out the study told TechXplore. "While plenty of data sources record in high resolution, current state-of-the-art object detection models, such as YOLO, Faster RCNN, SSD, etc., work with images that have a relatively low resolution of approximately 608 x 608 px. Our main objective was to scale the object detection task to 4K-8K videos (up to 7680 x 4320 px) while maintaining high processing speed. We also wanted to understand if and by how much we can benefit from high resolution compared to using low-resolution images, in terms of accuracy of the models." The attention pipeline proposed by Růžička and his colleague Franz Franchetti divides the task of object detection into two stages. In both these stages, the researchers subdivided the original image by overlaying it with a regular grid and then applied the model YOLO v2 for fast object detection. Resolution handling on the example of 4K video frame processing. During the attention step the image is processed under rough resolution, allowing the researchers to decide which regions of the image should be active in final finer evaluation. Credit: Růžička and Franchetti. "We create many small rectangular crops, which can be processed by YOLO v2 on several server workers, in a parallel manner," Růžička explained. "The first stage looks at the image downscaled into lower resolution and performs a fast object detection to get rough bounding boxes. 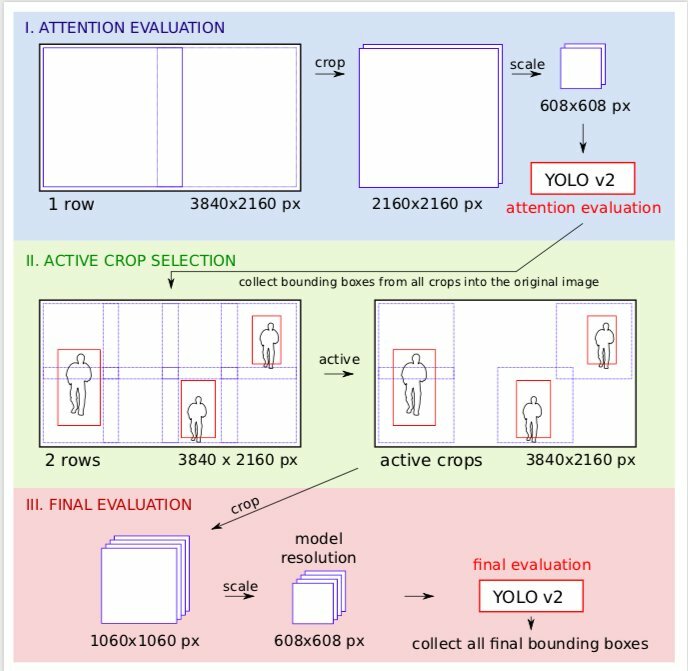 The second stage uses these bounding boxes as an attention map to decide where we need to check the image under high-resolution. Therefore, when some areas of the image don't contain any object of interest, we can save on processing them under high resolution." The attention pipeline. Stepwise breakdown of the original image under different effective resolution. Credit: Růžička and Franchetti. The researchers implemented their model into code, distributing its work across GPUs. They were able to maintain high accuracy while reaching an average performance of three to six fps on 4K videos and two fps on 8K videos. 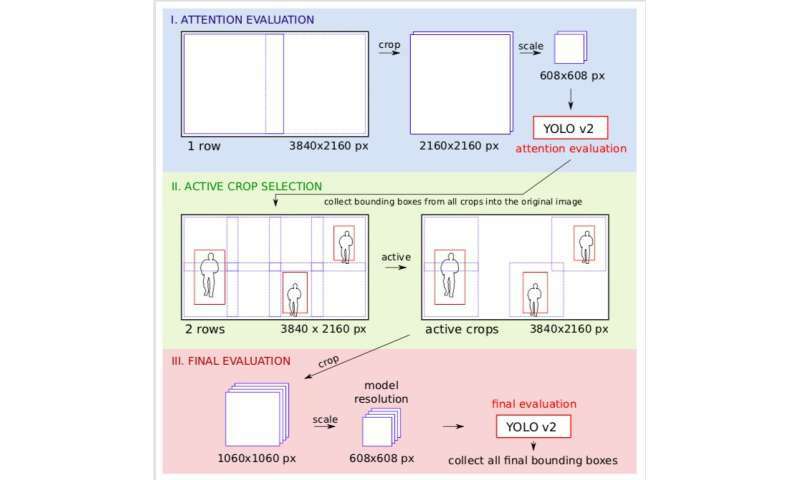 Their method yielded significant benefits, with the measured average precision on the tested dataset increasing from 33.6 AP50 to 74.3 AP50 when processing images in high resolution compared to down-scaling images to low resolution, which is how YOLO v2 generally works. Despite the very promising results attained by this new object detection method, the use of a regular grid overlaying the original image can give rise to a number of issues. For instance, it can sometimes result in detected objects being cut in half, which requires a post-processing step on the detected bounding boxes. Růžička and Franchetti are currently exploring ways of addressing and circumventing these problems to improve their model further.